Modern hospice was first institutionally developed in the 1970s in the United States by health and social workers, along with volunteer community members, in the form of hospice houses. Palliative (pain-relieving) care caught wind in hospitals and communities across the continent (Russ). Palliation “covers many bases. It affirms life and supports the dignity of patients until natural death. It provides services to families of all kinds, and caregivers of choice, including through bereavement, and it preserves personal autonomy” (Pettus). In the 1990s, in response to the devastation of the HIV/AIDS epidemic and in the absence of effective medication for the victims, the first prison hospices were introduced to address the soaring rate of death behind bars (Fleury-Steiner, 3). The principles of hospice and palliative care stand in contrast, and sometimes in opposition, to hospital-based medicine that emphasizes “cure” over “care” and avoids the reality of death. Hospice and palliative care prioritize spiritual and emotional comfort as well as physical ease, with a holistic focus. Hospice teams work to carve out a space for the patient to face their own terminality and work with their family to heal toward a “good” death (Russ, 128). Successful hospice care should ease death anxiety for the dying, as well as relieve traumatic grief experienced by family and loved ones. Nurses, social workers, physical therapists and volunteers work together to counsel their clients, discuss and mediate options and decisions, assist in post-mortem arrangements such as memorial services and burial proceedings with the client to hear their wishes and with the family on bereavement support. Within the criminal justice system, hospice programs have been applauded for their contributions to healthy prison reform. These programs are theorized to cause a “ripple effect” of respect and compassion through prison End-Of-Life (EOL) care in confinement (Stensland, 263). 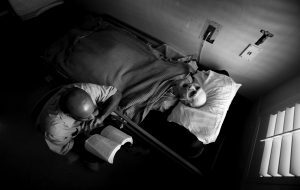 It is more evident, however, that prison hospice programs are a labor of love by volunteer inmates who work to comfort and care for their community members in defiance of the punitive prison healthcare systems and systemic inhumanity experienced daily, rather than helping to create “decent” prisons through their reform in a lasting way. “Within community-based EOL care, ethical principles are paramount and encompass issues of beneficence, justice and patient-autonomy that guide every aspect of care. However, within the correctional setting these same principles embody a different magnitude of meaning. The complexity of care in such a restrictive environment does not allow for offenders to fully receive these same ethical considerations…” (Stensland, 260). Hospice models in U.S. prisons face many obstacles to success. The institutions themselves immediately contradict some of the primary aims of palliation, such as maximizing comfort through the use of palliative medicine (prescription painkillers or even opioids are necessary for relief), patient autonomy, encouragement of family and community connection and decisions, as well as mutual respect between the inmate and their hospice team. Expectations of improper and undersupportive healthcare are common in civilian populations. Civilian hospice enrollment goes down among poorer and marginalized communities of color that have often experienced medical neglect, scarcity and disrespect. These communities have not been shown that the medical industry has their best interests in mind, so they are often wary of hospice (Vig). Similarly, non-prison communities are feeling the stretch of EOL care as the large generation of U.S. babies born in the late 1940s to the early 1950s are aging into retirement and geriatric care (see Senior Care in The U.S.). In U.S. society an elderly citizen would be expected to be 65 years or older. Correctional systems and studies, however, consider the age of elderly inmates to start at 50, after factoring in likelihood of quality and preventative care and health before prison, as well as the psychosocial and physical detriments of life behind bars (Wright & Bronstein, 6). One study cited in a Vanderbilt News article, suggests that for every year spent in jail an inmate can expect a two year decline in life expectancy (Patterson). Rapidly growing prison populations mirror nonconfined society’s “graying” of the baby-boomers. This process is exacerbated in states with “three-strikes” laws, and increasingly popular “truth in sentencing” laws that discourage parole before an inmate has completed their sentence. Prisons are under pressure to foot the bill for quality EOL care and face extreme ethical issues if they fail to rise to the task. Contrary to the ethical task of bringing prison healthcare to a human standard, in 2012 most state and federal prisons in the U.S. transferred their state-run prison healthcare systems to private corporations. That year “the count of inmate deaths spiked to a 10-year high in January and continued at a record pace through July” (Beall). 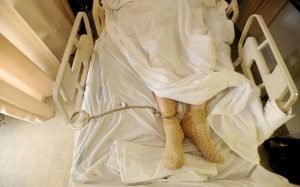 When a prisoner is sick, untrained prison staff is often in the position of determining terminality or the hopefulness of curative medical care. In the case of a prisoner who has likely not seen health advocacy or aggressive care for their condition while still curable, a patient may easily be forced or coerced into hospice for lack, but not want, of care (Chavez, 29). Prison budgets find a cost-cutting opportunity through passive denial of curative care, which can be incredibly expensive, in the interest of graduating the patient to only palliative options. Additionally, in order to access hospice services for a terminal inmate they are required to sign a Do-Not-Resuscitate (DNR) order, which is not required for hospice patients outside of prison to receive care. DNR is a crucial choice in a living will, that requires health attendants to refrain from performing CPR, defibrillation, inserting breathing tubes or using resuscitative medicines (MedlinePlus). Patient self-autonomy is impossible in a passively, or even directly, coercive environment that is constrained by profit interests and disallows critical decisions in the EOL. It must follow that the principles of hospice, and medical care generally, apply to everyone receiving such care. Prisons and jails reason that holistic models of hospice cannot function within prison for many reasons, having to do with security of the prison itself and the maintenance of punitive theory in practice. The transportation of patients to outside hospitals is acted out without warning, to avoid an opportunity of prison escape (Stensland, 264). Full-spectrum hospice threatens to puncture the impermeability of the prison structure, and certainly punctures the success of the punitive theory. The Louisiana State Penitentiary, or “Angola,” so nicknamed for one of the four chattel slave plantations that previously operated on the prison’s land plot, was one of the first in the country to incorporate a prison hospice. Its success is attributed to an enthusiastic warden and emphasis on rehabilitation for his prisoners. As it works out, Angola confines one of the largest populations of prisoners serving life sentences. About 85% of the inmates are expected to die without release (Chavez, 26). Prisoners, not the warden or the prison staff, perform the labor of emotional and spiritual palliation for their fellow inmates. After death, the prisoners plan and maintain the funeral rites. 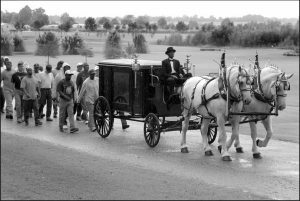 The body is enveloped in a velvet shroud that has been sewn for the purpose by prisoners, then into a wooden casket built by prisoners, prisoner pallbearers carry their kin to the horse-drawn hearse that was also built by prisoner carpenters, which is then steered to burial by a prisoner driver (Chavez, 27–28). Beall, P. (2014, September 27). Privatizing prison health care leaves inmates in pain. My Palm Beach Post. Chavez, E. K. (2016). My Brother’s Keeper: Mass Death in the Carceral State. Social Justice, 43(2), 21–36. Dubler, N. N. (1998). The collision of confinement and care: end-of-life care in prisons and jails. The Journal Of Law, Medicine & Ethics: A Journal Of The American Society Of Law, Medicine & Ethics, 26(2), 149–156. Fleury-Steiner, B. D. (2009). Dying Inside The HIV/AIDS Ward at Limestone Prison. Ann Arbor: University of Michigan Press. Patterson, J. (n.d.). What a prison sentence continues to take after release. Vanderbilt News. Russ, A. J. (2005). Love’s Labor Paid for: Gift and Commodity at the Threshold of Death. Cultural Anthropology, 20(1), 128–155. Stensland, M., & Sanders, S. (2016). 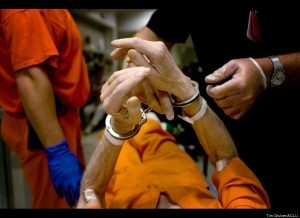 Detained and Dying: Ethical Issues Surrounding End-of-Life Care in Prison. Journal Of Social Work In End-Of-Life & Palliative Care, 12(3), 259–276. Vig, E. K., Starks, H., Taylor, J. S., Hopley, E. K., & Fryer-Edwards, K. (2010). Why Don’t Patients Enroll in Hospice? Can We Do Anything About It? Journal of General Internal Medicine, 25(10), 1009–1019. Wright, K. N., & Bronstein, L. (2007). Creating Decent Prisons: A Serendipitous Finding About Prison Hospice. Journal of Offender Rehabilitation, 44(4), 1–16.